Post on Google hard drive study covered important issue that first months are critical to determine hard drive health. Bad blocks is one of the most common sign of failure so scanning drive surface for those is good move both early and from time to time. HDDScan is easy to use but quite powerful utility for this task. In recent versions interface got quite confusing (eye-candy gone bad) so it may take some time to figure out. After launching surface test additional window is available with through output graph and surface map. access to hard drive features, such as acoustic management. « What software are you looking for? The software certainly looks pretty (looks identical to WMP). Gonna give it a try. But to be honest the only software that I really trust is SpinRite. Its the grand dady of all HD tools and is still the best by far for diagnostics as well as repair. For SMART I use CrystalDiskInfo (those guys have a separate tool called CrystalDiskMark for benchmark). Spinrite is powerful stuff but no longer developed and relatively (especially relatively to free :) expensive. MHDD does similar stuff but is free, need to do a post on it as well. As for HDDScan it is simple way to test surface right under Windows, a lot of folks need and ask for just that. 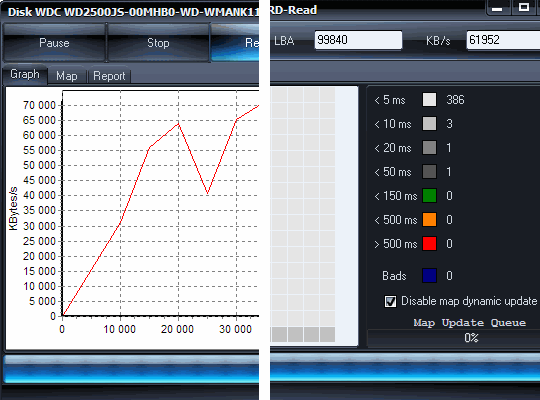 We have released a new version of HDDScan – v.3.3. This version includes Windows 7 and Vista support and works with SSD! Thanks for heads up, bookmarked new version to check out and Appnewsed it.